Teela-Wooket was founded as a Vermont riding camp in 1913. In 1985, Ted Hoehn, well-known as a top player in the US Master's division purchased the camp, which has been recognized since 1968 for the quality of its tennis camps. The camp has 21 clay tennis courts outdoors and one indoor and a tennis staff of 25 instructors. The camper-to-coach ratio is 4:1, which ensures an abundance of attention. Campers are placed in groups first by ability, then by age and size. Together they work on their stroke preparation, footwork and correct body mechanics to prepare for match play. Campers can sign up for as many as 4 hours of daily instruction as well as take advantage of Early Bird tennis before breakfast. Private lessons are scheduled on Sundays. On- and off-camp matches are arranged weekly. Windridge also offers other majors in sports such as soccer, horseback riding, and golf. Campers may elect to participate in 1 sport up to four hours per day and then fill the rest of their day enjoying our many elective activities. These include: mountain biking, basketball, volleyball, arts & crafts, dance and drama, archery, swimming, lacrosse, ropes course and more. 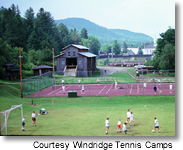 Here's what others have had to say about Windridge Tennis Camp at Teela-Wooket.